The news just keeps getting worse for Apple (AAPL) with all the negative rumours being confirmed by the top-line warning announced last night. In my last post on AAPL, I ruminated that the stock could fall as low as $160. Well, it was trading below that figure prior to last night’s warning and it looks set to possibly test $140 today. The only bright side of the announcement is that it quantifies the bad news which is the first step towards reaching a bottom. The enviable round of analyst downgrades means the next few weeks will likely be choppy for both AAPL and the market. In the interim, I quickly revised some numbers in my model, as below. 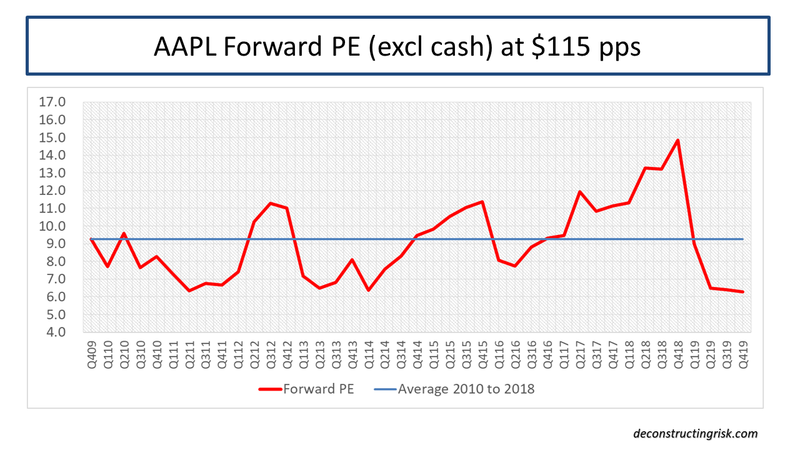 Based upon my historical forward multiples excluding cash, whilst reverting to a straight average multiple of 9 compared to an increasing multiple (that was in another era now! ), my new estimate of how low AAPL can go is $115 per share, a near 30% drop from last night’s close. Whether I will be a buyer around the $120 level will depend upon what the overall market is doing. Best to wait on the side-lines for this drama to unfold. 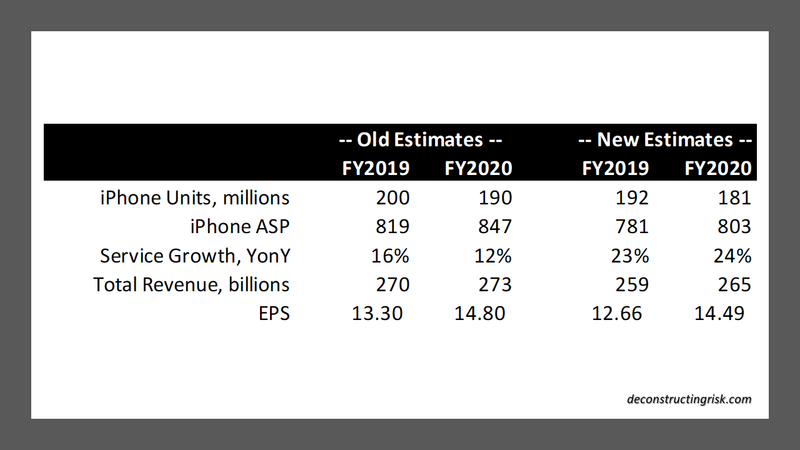 This entry was posted in Equity Market, Investing Ideas and tagged 2019 AAPL price target, AAPL, AAPL 2019 estimates, AAPL 2019 projections, AAPL 2020 estimates, AAPL 2020 projections, AAPL ASP 2018, AAPL multiple, AAPL overvalued, AAPL profit warning, AAPL revenue miss, AAPL service revenues, AAPL undervalued, AAPL valuation, Apple, average selling price, fair value AAPL, iPhone 8, iPhone 8 unit sales, iPhone installed base, iPhone installed base 2019, iPhone super-cycle, iPhone unit sales, iPhone X, iPhone X unit sales, iPhone XR, iPhone XS, iPhones upgrades, peak iPhone, R&D spend, secondary iPhone users, segmenting iPhone, smartphone market, smartphone saturation. Bookmark the permalink. Second, it looks like Tim Cook upset the Apple cart (pardon the pun). Good news imo is that servies are growing faster (which should help them going forward given that the base of installed devices won’t grow that much), so The Oracle or one of his sidekicks had the right intuition once again.